The first of Åke Edwardson's Erik Winter crime novels to be translated into English, Sun and Shadow, was apparently the sixth in the order of the series's original publication in Sweden. That was followed by translations of the seventh and eighth books in the series, and then by the translation of Death Angels, which was actually the third in the order of first publication. 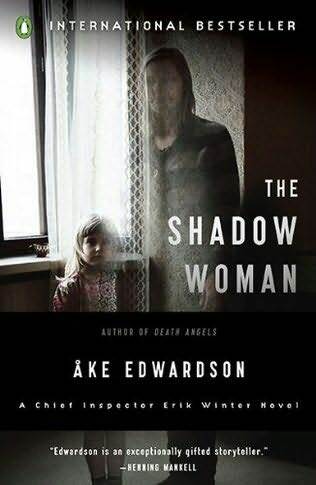 Now the fourth in the series (right after Death Angels, whose Swedish title actually means Dance with an Angel) has now been published in English by Penguin, translated by Per Carlsson: The Shadow Woman, whose Swedish title, Rop från långt avstånd, actually means "cries from far away." But all that confusion shouldn't put anyone off The Shadow Woman, which is a first-class police procedural. The investigation is a particularly frustrating one, which concerns the disccovery of a body near a lake. Winter and the police cannot discover who the woman was, and a parallel narrative about a young girl who is taken from her mother during some sort of getaway from a crime, gives the reader a sense of the anxiety that will befall Winter and his team later in the book (though not in quite the way that the reader may think). There are several other plot lines int eh background, most of them concerning biker gangs, evidently a big factor in Southern Swedish crime (and even bigger in Denmark, where Winter eventually needs to go for answers). My only quibble with the book is that one clue that unravels the final elements of the story is withheld from the reader in a way that other clues are not (Winter knows about that clue but we don't). Not a big deal, but in a story that is about the frustrations of a police investigation that has too few clues and too little information, withholding that one clue grates a bit. Still, The Shadow Woman is a compelling story, and one of the best of the Erik Winter series. I was not a huge fan of Åke Edwardson after reading the first couple of books to appear in English, but I'm convinced now—he's in the first rank of Swedish crime writers. One question for dedicated readers of Scandinavian crime: I can think of a number of Swedish crime novels in which the detective travels to Denmark during the investigation, but I can't think of a single time when the detective travels to Norway (except for a chase scene in The White Lioness in which Wallander crosses the Norwegian border in pursuit of the killer). Are there trips to Norway that I'm not aware of? This order of translation seems even more bizarre than most, and we have seen some. I had not realised the full extent of the Edwardson ouevre until reading your post - I had previuosly thought Sun&Shadow was 3, and the two just translated were 1 & 2. I liked Sun&Shadow, Never End and Frozen Tracks - but not quite enough to go back and read the earlier ones in the series now being translated. But in view of your review, clearly I should, as The Shadow Woman sounds great. I can't recall Swedish detectives travelling to Norway. Finnmark (is that the right place? Where the Samis live) seems quite popular, eg Red Wolf (Liza Marklund), Let the northern lights erase your name (vendeda veda), and I have an idea maybe Blackwater (Ekman) and the Black Path (Asa Larsson) involved the far north, but maybe not as far round as Norway. Kerstin Ekman´s fictional setting is near the border, but in Blackwater I think it is Sweden/Finland. In her famous trilogy (same setting), characters move across the Swedish & Norwegian border a lot. 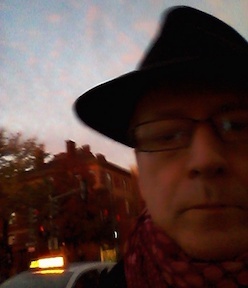 Åke Edwardson has written another novel where the protagonist goes to Denmark, called "The Danish Connection". I think it is an early one, and though that series was okay, I don´t expect it will be translated. Dorte: I wonder if my count of the Erik Winter series is accurate--are there some of his early novels that pre-date the first Winter novel? Do you know where in the series the ones translated into English fit? This is what my Danish biography page says. I have added the English titles I can look through, but don´t know the original title of "Frozen Tracks." So my timeline in the post above is not correct (and Maxine was right): the new book, The Shadow Woman is, I guess, the 2nd Erik Winter book. My timeline was based on Wikipedia, but that only gives titles, not the central character, and I don't have access to the first couple of (non-Winter) books. I can't think of a novel, but the excellent Norwegian film, Insomnia (not the US remake) takes a Swedish detective to northern Norway to investigate a crime, but things go horribly wrong. The differences between Swedish and Norwegian policing (and language and attitudes and many other things) are played up to great effect. After that, I don't know if there are any further English translations. I haven't found any yet.